Love makes the workforce go round. The secret to happy, engaged, high-performing employees might be as simple as having an office bestie – and the right social communication app. Nearly 40 percent of respondents in Virgin Pulse’s 2015 survey of more than 1,000 full-time employees in the U.S. and Canada indicated their co-workers as the top reason they love their company, a jump of nearly 30 percent year-over-year. Perhaps even better, 66 percent of respondents indicated their relationship with colleagues positively impacts their focus or productivity at work. What’s more, 55 percent said their co-workers positively impact their stress levels on the job. A final “Fist Bump” level factoid, employees with a best friend at work, are 7 times more likely to stay at their job. Relationships are how employees build the feelings of trust, identity, well-being, and altruism – all of which are at the heart of a highly engaged workforce. Need a nudge to help make those connections and build the relationships that lead to engagement, increased productivity and that “Heigh ho, heigh ho” outlook? 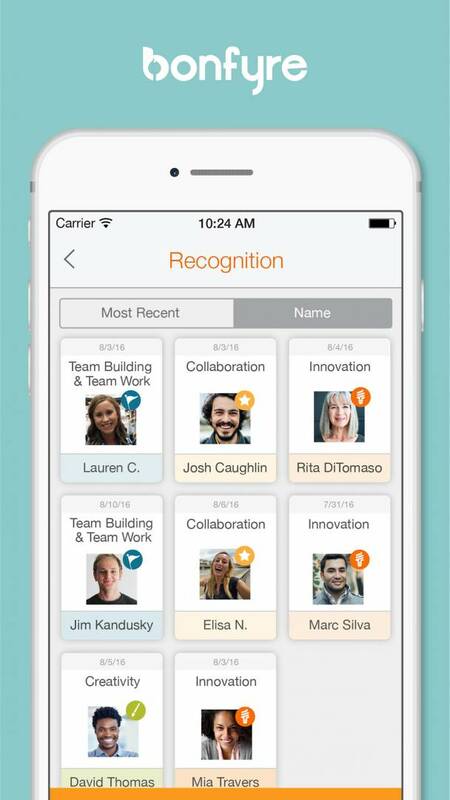 There are a number of companies that operate in the employee engagement and recognition solution software space, including Bay Area-based Achievers and Toronto-based, WorkTango, which was founded by two of the founding employees of Achievers. According to Rob Catalano, Co-Founder of WorkTango, a few managers at Achievers are currently beta-ing the WorkTango platform, so watch this space for future developments. Bonfyre operates across the end-to-end spectrum of culture touch points: team building, recognition, internal communications, and events. Additionally, it provides employee feedback loops and generates employee insights that support ongoing culture and employee engagement initiatives – which give HR departments what they need to make sure company culture gets better and better. Bonfyre works with companies like Maritz, Express Scripts and Golden Corral offering an enterprise-level culture platform to help connect thousands of employees. Bonfyre is available in the App Store and Google Play in Basic, Event and Enterprise versions. Downloading the Basic Android version onto my Samsung Galaxy S7 Edge was quick and without any hitches. I was asked to enter my email address, and once I had replied to a mail verifying this, was asked to create a password, and that was it – my account was created, and I was in business. The user interface is clean, and the app is intuitive to use. Unlike other event apps I have used I was not left hanging trying to find where something, e.g. the location of the search feature. Tip #1 – Bonfyre is private, and one is in control of who sees one’s content. Tip #2 – To share content one just has to click on the text box or camera at the bottom of the screen. Tip #3 – Use the “@” when writing a chat or a caption and the name of the person in a particular Bonfyre community, and a notification will be sent to that person. Tip #4 – Information can be organized using #hashtags. Tip #5 – How to create a private Bonfyre community. 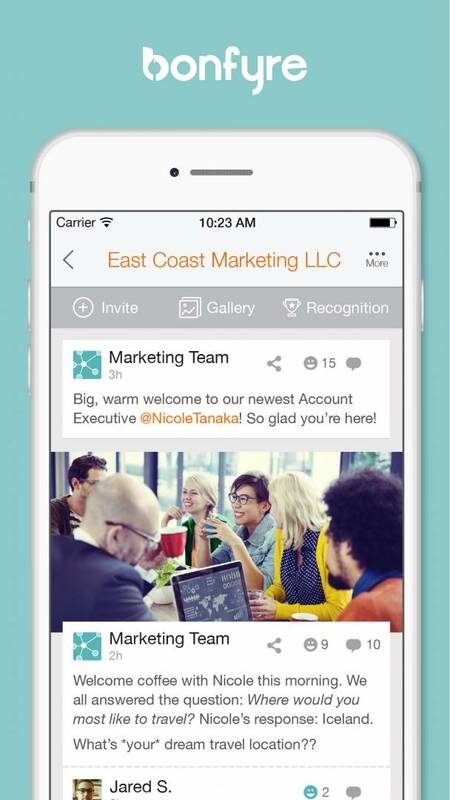 Basic (<100 employees) is free to download for Apple and Android devices. 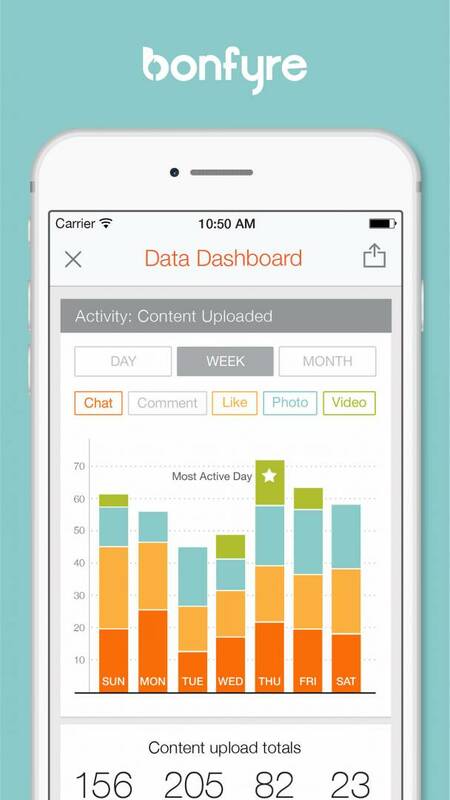 Groups fewer than 100 can access basic features like chat, photo, and video sharing. Event (100+ Employees) starts at $1,500 and includes agendas, networking tools, maps and planning and content support from Engagement Advisors. Enterprise (Unlimited) is based on a monthly fee per number of employees, starting at $7.95 per head for 100+ employees, to $2.95 per head for 10,000+. Enterprise grants access to additional networking, engagement and analytics tools – including pop surveys, fundraising, and trivia. It also includes unlimited Bonfyre communities and analysis, as well as content and strategy support from the team of Engagement Advisors. A number of events that I attend make use of event apps. Some of these can be frustrating to use, especially when Search is not on the first screen, making it difficult and time-consuming to find an attendee’s name or company affiliation. Bonfyre has none of these Search limitations. Search worked almost too well, and one recommendation I would have for a future build is that one has a choice as to whether a Bonfyre community name is visible to search or not – as in Facebook’s secret groups where the name of a secret group does not appear in search. The contents and members of the Bonfyre communities are not visible – they are password protected – but one could imagine some occasions, e.g. competitive intelligence, when one would not want the name of a Bonfyre community to appear. For those of us that have learned the hard way that social media such as Facebook can translate into too much information for comfort, and that not everyone should be your friend, Bonfyre at the Basic level offers privacy and the ability to precisely and selectively share. While I was not able to test the Event and Enterprise levels, the screen shots suggest that they would be as intuitive to use as the Basic level. Gail is a Chicago-based food scientist who writes for leading US and European food and technology publications. A devotee of all things shiny, electronic and buzzing, with a passion for building on-line communities and conservation, she is an entrepreneur and founder of a sustainability and social media startup who moonlights on weekends as DJ Moongirl on Moonalice Radio. Clients range from rock bands and media companies to high-tech startups.